A deliciously simple and quick recipe. It's particularly good if you use really good fillet steak. 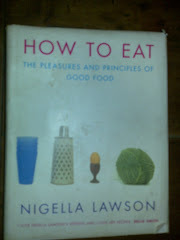 Nigella recommends cooking the steak through, which i did, but i reckon if you like your steak rare, then cook the steak for less time. - Gently fry 1 large finely chopped onion in 30g butter and a drop of oil. 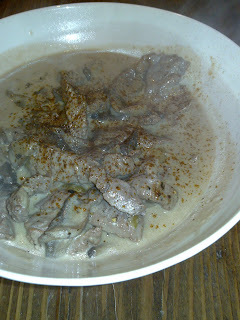 - Add 30g more butter and when melted, add 225g sliced mushrooms, and cook for 5 mins. - Grate some nutmeg and add some pepper. - Stir well and remove to a plate. - Add another 30g butter with some more oil, and turn the heat to high. - When the butter's hot, stir fry 750g beef fillet, cut into thin strips. - Return the mushrooms/onions to the pan, add some more nutmeg, 1 teaspoon dijon mustard, and 200ml creme fraiche. - Season, and sprinkle over some paprika.